Since its inception as the Strictly Stock Division, what is now the Monster Energy NASCAR Cup Series has evolved into one of the most popular sports in the world. In the beginning, the race cars were driven off the street and onto the track, but as safety technology advanced, changes were made to cars, as the racing machines of today are more complicated and technological than ever. NASCAR has grown with the series from the small organization formed on the sands of Daytona Beach to a thriving sport. 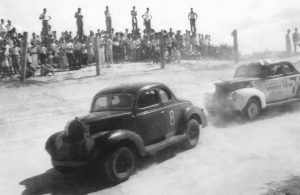 DECEMBER 14, 1947 – Bill France Sr. organizes a meeting at the Streamline Hotel in Daytona Beach, Fla., to discuss the future of stock car racing. NASCAR, the National Association for Stock Car Auto Racing, is conceived. JUNE 19, 1949 – The first NASCAR “Strictly Stock” (current Monster Energy NASCAR Cup Series) race is held at Charlotte (N.C.) Fairgrounds Speedway. Jim Roper wins the race, Bob Flock wins the first pole and Sara Christian, who finishes 14th, is credited as the first woman to race in NASCAR’s premier division. OCTOBER 16, 1949 – Red Byron wins the first NASCAR Strictly Stock championship. 1959 – Jim France, son of Bill France Sr., joins the staff at International Speedway Corporation (ISC). He worked in all phases of operation in his early years of the company and moved up to serve as vice chairman/executive vice president of NASCAR and is also chairman of the board at ISC. 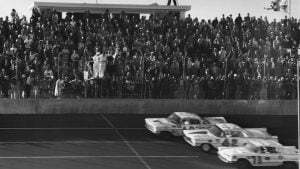 FEBRUARY 22, 1959 – The high-banked 2.5-mile Daytona International Speedway hosts the first Daytona 500. More than 41,000 fans are in attendance for the inaugural event in which the winner isn’t decided until 61 hours after the checkered flag flies, as the result of a dramatic photo finish. Lee Petty is declared the winner by two feet after conclusive evidence from a newsreel is reviewed by Bill France Sr.
DECEMBER 1, 1963 – Wendell Scott becomes the first African-American to win a race in NASCAR’s premier series, beating Buck Baker at Jacksonville (Fla.) Speedway. 1970 – Lesa France Kennedy, daughter of Bill France Jr., joins the staff at International Speedway Corporation (ISC). Instrumental in the growth of ISC and the advancement of motorsports, she has moved up to serve as vice chairperson of NASCAR and vice chairperson of the Board of Directors for ISC. JANUARY 10, 1972 – The founder of NASCAR, Bill France Sr., hands over the reins of leadership to his son Bill France Jr., who becomes the second president in NASCAR’s history. FEBRUARY 20, 1977 – Janet Guthrie becomes the first woman to compete in the Daytona 500. She qualifies 39th and finishes 12th. FEBRUARY 18, 1979 – CBS presents the first live flag-to-flag coverage of a 500-mile NASCAR event with the Daytona 500, a show not soon to be forgotten as Richard Petty avoids an incident between Cale Yarborough and Donnie Allison on the last lap to win the race. With Petty racing by to take the checkered flag, Yarborough, Donnie Allison and Bobby Allison are involved in a fight in the infield grass, between Turns 3 and 4. NOVEMBER 18, 1979 – Richard Petty wins his record seventh series championship. JULY 4, 1984 – Richard Petty earns his 200th win in the Firecracker 400 at Daytona International Speedway, setting a mark that has yet to be challenged. NOVEMBER 15, 1992 – One of the most significant races in NASCAR history, the 1992 season finale at Atlanta Motor Speedway. It is Richard Petty’s last race and Jeff Gordon’s first in NASCAR premier series competition. Five drivers are eligible to win the title as the race began. Driver-owner Alan Kulwicki ends up leading one more lap than Bill Elliott, to earn the five-point bonus for leading the most laps – and win the championship by 10 points. AUGUST 6, 1994 – The series schedule expands to include the famed 2.5-mile Indianapolis Motor Speedway. 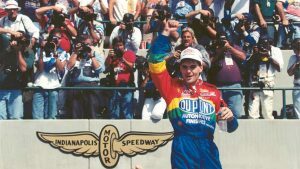 Jeff Gordon claims the win in the first Brickyard 400. OCTOBER 23, 1994 – Dale Earnhardt joins Richard Petty as the second driver in series history to win seven NASCAR series championships clinching the title at Rockingham, N.C.
JANUARY 2003 – NASCAR unveils the NASCAR Research and Development Center in Concord, N.C.
2004 – NASCAR begins its first season under the banner of Nextel, with the series becoming known as the NASCAR NEXTEL Cup (now the Monster Energy NASCAR Cup) Series. A new format is implemented to determine the series champion and is known as the Chase for the NASCAR NEXTEL Cup (now Monster Energy NASCAR Cup Series). MAY 23, 2010 – The inaugural NASCAR Hall of Fame class is inducted in Charlotte, N.C.: Bill France Sr., Bill France Jr., Richard Petty, Dale Earnhardt and Junior Johnson. FEBRUARY 17, 2013 – Danica Patrick makes history by winning the Coors Light Pole Award for the 2013 Daytona 500, becoming the first female to win a pole in NASCAR premier series history. JANUARY 30, 2014 – NASCAR Chairman Brian France announces championship format change, virtually guaranteeing a berth in the NASCAR playoffs for each race winner. Key among the changes is a ‘Championship 4’ finale where the highest finisher among the four eligible drivers at Homestead-Miami Speedway would be crowned champion. 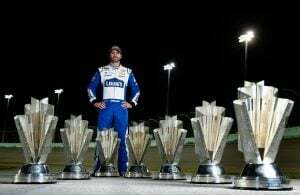 NOVEMBER 20, 2016 – Jimmie Johnson makes history with his record-tying seventh NASCAR premier series title; joining NASCAR Hall of Famers Richard Petty and Dale Earnhardt as the series leaders with seven championships. DECEMBER 1, 2016 – NASCAR and Monster Energy announce a multi-year agreement for the premier series entitlement as well as the prestigious annual NASCAR All-Star Race. Monster Energy, began its tenure as naming rights partner on Jan. 1, 2017, will become only the third company to serve as the entitlement sponsor in NASCAR premier series history, following RJ Reynolds and Sprint/Nextel.